One of the great things about our profession is the multidimensionality of the patients we treat. When it comes to the distance runner, we have to mentally adapt our preconceptions that there is a limit to the human spirit regarding how far some of our patients are willing to run. With a rise in ultra distance races, some of our patients may land on our treatment tables with what seem to be extreme endurance goals. The following is designed to orient the physical therapist on how to approach the distance runner while maintaining confidence in your practice of physical medicine. What you will often find, is if the athletes themselves are dedicated and willing to rehabilitate and recover safely, there are aggressive boundaries you can push to achieve optimal performance in a more timely manner. What distance or event is your client training for? This will give you an idea of the physical demands required and timeframes needed as your working through the rehabilitation process. Get familiar with common distances, such as the 5k (3.1 miles), half marathon (13.1 miles), full marathon (26.2 miles) or ultra marathon (referenced as anything over 26.2 miles). Check with your local running community for races near you. Goal to complete or compete? Is your patient trying to achieve optimal performance or just looking to participate in the event for more other reasons, like fundraising or bucket-list checking? As the PT, make sure you mirror the patient’s big picture goal as you help modify their training program. The foundations of a S.M.A.R.T. (Specific, Measurable, Attainable, Realistic, Timely) goal become vital when projecting a plan towards any distance race day, especially when you are bridging a big amount of rehabilitation needed in a short amount of time. Ensure a good nutrition plan is in place by having your patient see a registered dietician or certified sports dietitian for marathon distances or greater. How to approach the leisure runner vs. the born-to-be-wild runner. It is important as a therapist to hone in on the concept that running is unquestionably a sport. There may be no goal scoring, few penalties, only subtle strategy focused more on self than the team. But, do not forget running requires significant diligence, commitment, endurance, and appreciation of means to an end when it comes to reaching their goals. In the world of serious distance running, the word ‘jog’ does not really exist. In order not to offend those patients, try language like strider, recovery interval or specific % of HR max or effort to reference prescription of speed changes you are hoping to see. Don’t tell them to just go out for a jog, because they will either get offended or push the pace anyways if not given specific directions. Respecting the masochism it takes to be a distance runner will go a long way with this patient population when there is a mutual understanding that being back on the road is the ultimate goal. Keep their attention and build their trust! Have clinically-based conversations with your patient that focus on science. Engage the patient by teaching them what you know about anatomy and the biomechanics of running to gain initial buy-in. Utilize the FITT (Frequency, Intensity, Type, Time) principle just like a normal training approach but tailor it to therapeutic exercise in the initial phases while showing your patient there is a method to your madness. You may initially even have to increase their step rate to lessen force through the limb by 14%. (1) Your goal is to keep them in the game functioning as safe and appropriate as possible. The priority here is to educate the parents and engage the coaches/teachers that being careful with children in distance running, even if a bright new running star is found, is imperative. At the collegiate level, individual and team scores become more important for seeded and qualifying for championship races and maintaining scholarships. At the professional level, prize money or a career income may be on the line. As a physical therapist, respecting the client as a pre-teen or teen, not just a small adult is important, too. There are many biological processes happening that excessive running can put undue stress on the developing system, including risk of injury to growth plates, hormonal imbalances or body image issues. When issuing flexibility exercises, remember kids and runners both like to move, not sit idle and stretch. Extrinsic vs. intrinsic mechanisms of dysfunction. Musculoskeletal limitations will be the main focus in physical therapy for treating the runner. If the mechanism is extrinsic, like blunt trauma from a fall, challenging uneven surfaces causing sprain/strain overload or even elective surgery, you will have to focus treatment based on acuity of injury and physiological healing time. If you are able to see the patient on a more frequent basis, this will help you monitor how the treatment is being received by the tissue and gauge how aggressively you can push rehab time frames. Look for pelvic upslips, pelvic rotations, functional leg length discrepancies or hip mobility/ ROM discrepancies. Assess feet both non-weight bearing as well as weight bearing to find abnormal subtalar neutral position as a possible cause to dysfunction. Assess joint accessory mobility of the midfoot and rearfoot to pick up on concerns with the ankle during closed-chain running tasks. Note pre-existing things like pes planus (flat foot)/ pes cavus (high arch) or rotated 1st rays to see structural predispositions that may contribute to dysfunction that will be amplified during running. Clinical tests (Can be barefoot/ or shoe supported. Re-tests should be under same conditions). This test assesses a patient’s balance and control on a single leg, mimicking the swing through running phase, as the opposite leg is stable. Use visual assessment of sway grade, patient-reported difficulty scales or measure repetitions patient is able to complete with a set distance of excursion of the trunk/leg. Assess anterior to posterior, lateral opposite lateral, followed by rotational anterior cross lateral and posterior-lateral directions to cover three planes of motion. This test assesses a patient’s control, stability and strength on a single leg by unlocking the muscular chain needed to create depth in a single leg squat. Use visual assessment of sway grade, difficulty scales measured by cm reach ability of opposite heel or measure stance leg knee flexion depth. Assess anterior reach, lateral reach and posterior-lateral directions. 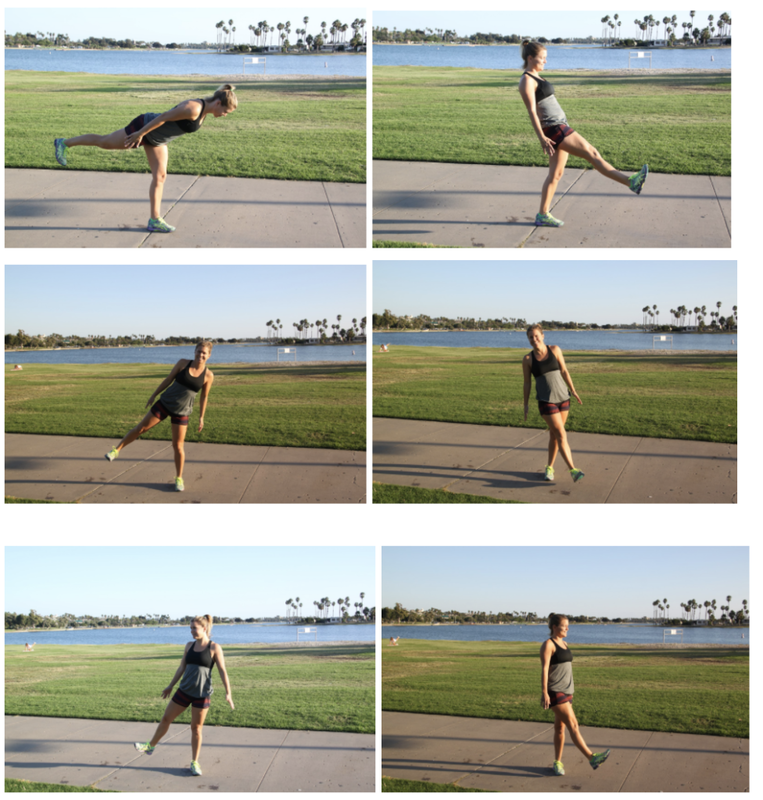 #3 Leap to Single Leg Squat with triplanar motion challenge. This test assesses a patient’s ability to generate power and control of slowing of displaced momentum as motion is transferred from one leg to landing on the other during a leap. Assess anterior, lateral and posterior-lateral leap directions. Use visual assessment of sway or difficulty scales, measure cm from start to finish landing position or depth of squat once landed with as long as controlled. Custom orthoses (aka orthotics), OTC inserts. If optimal biomechanics and load is not achieved through therapeutic exercise alone, there is the option of external support. Invest in your own continuing education or work closely with trained professionals (podiatry, orthotist or movement specialist physical therapist who considers the identified biomechanical deficits in the individual runner patient). If choosing over-the-counter inserts consider ones that are moldable, yet stiffer to be most supportive for running forces. Low 0-4mm drop or ‘minimal’ shoes, neutral 6-8mm drop, or 10-12mm drop maximal options. If a runner has custom orthoses, a neutral footbed shoe is recommended so there is no doubling up on corrective posting. 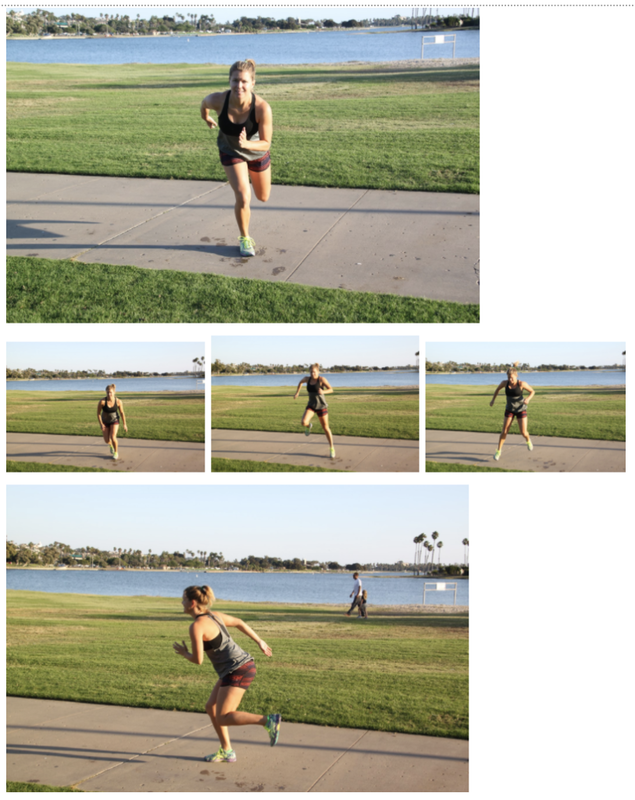 From my own practice, the more flat-footed runner does best with balance and control work barefoot and a more stiff and minimal shoe when running. Their foot has been adapted over time being lower to the ground that too big of a corrective addition may introduce a whole new set of problems. The higher, rigid arch runner typically does better working with their foot and ankle mobility barefoot, yet running in a more cushion and maximal prototypes. Of course, the more complex history of injury often tends to a more cushion shoe for immediate patient comfort and every runner will not necessarily be one foot type or the other having variance in other parts of their foot and ankle. Ongoing care/ importance of self-maintenance. It is typical to find the runner patient who has chronic or recurrent problem areas. Once a dysfunctional cause is identified and strategies to treat the underlying cause have been established, patients should be guided in self-help techniques. 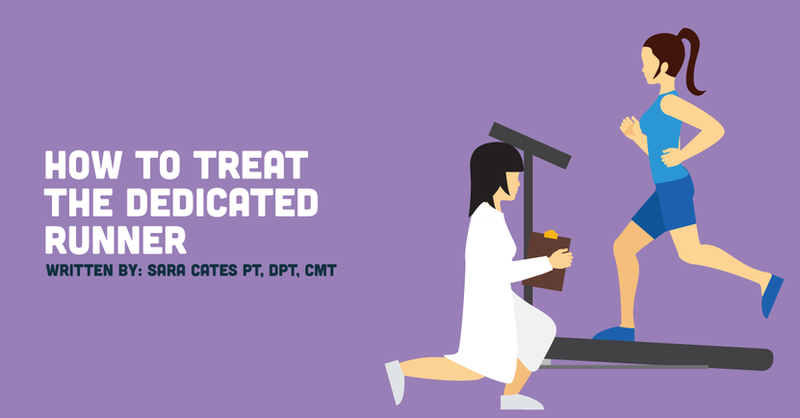 Continue to extrapolate on origin of injury as the focus of your evaluation and treatment approach because many times the patient has sought out other therapies or treatment attempts that have only treated the symptoms temporarily. You can make quicker and more impactful gains if you always come back to the biomechanics and science of why their musculoskeletal system is failing. *As a physical therapist, it is important to trust and practice the science. Principles of biomechanics will always hold true, so do not be afraid to start over at square one of assessment if you get ahead of yourself. Once the runner-patient has met their goals, it is important for the therapist to wear a coaching hat on educating the patient the benefits of recovery and reassurance that any injuries sustained during the goal should be treated through maintenance so to not linger. To avoid the post-race loss of purpose feeling, it can be helpful to encourage patients try more active recovery like hiking, swimming or yoga or go on an adventurous vacation to fill the void of loss of a training program. Ending with the end in mind. There is no doubt that running can be stressful on the body, specifically when it comes to long-term joint health and avoidance of osteoarthritis in the lower extremities. Luckily, consistent stretching and smart training can help avoid undue stress and running can be fun and engaging sport throughout most years of life. Our bodies are amazingly resilient and distance runners have an uncanny and dysfunctionally satisfying relationship with pain. Some find running to be their meditative sanctuary, and others view it as the ultimate challenge of self. This population is generally bright and driven in many aspects of their life that limits their ability to accept the word moderation. If executed properly you can have a very rewarding experience getting a distance runner back on the road as a sidekick to their journey.